In Turkish keçiboynuzu translates most picturesquely into ‘goat’s horn’. 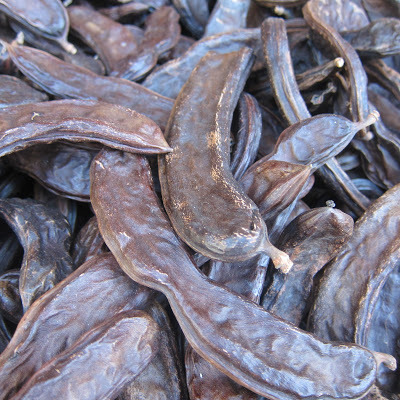 But the point is, what do you know about carob? Sometimes I reflect on how unobservant I can be as I have noticed these strange black pods out of the corner of my eye when I am out and about but I think I probably thought they were some sort of relative of vanilla pods! I have never seen carob pods being sold in such vast quantities as when we visited Saklıkent Gorge last week on our recent boat trip down south. After sitting at the floating teahouse and having a çay and before retracing our steps to the minibus, we saw an inviting row of stalls with interesting-looking baskets and sacks of locally made nar ekşisi (pomegranate molasses), dried herbs, nuts and THESE. Oh what a magnet for me and my English friends…. 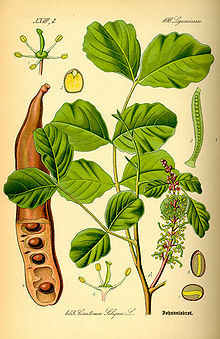 The carob tree, a native of the Mediterranean, is also called St John’s Bread because John the Baptist ate the pods while he was in the wilderness. It can bear fruit for 100 years! It had its heyday during the 70s as a healthy hippy substitute for chocolate because it contains no caffeine or theobromine, another mild stimulant. Compared to chocolate, it’s three times richer in calcium, has one third less calories, and 17 times less fat. Apparently carob powder is also used to make chocolate-flavoured treats for dogs (and cats) because real chocolate is bad for them. Not only is it nutritious, it’s therapeutic. Just remember to take some carob powder with you when you go on your next trip as it’s a natural remedy for serious diarrhoea in both adults and infants. Animals too. Use 1 tbsp in a cup of liquid or make a paste. Hmm. 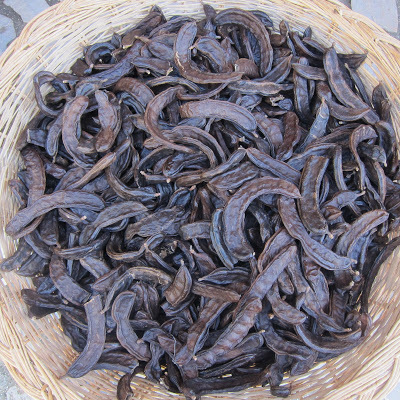 The long knobbly black pods are typically dried or roasted, then ground to a powder which can be used for baking. The proportions are: 3 tbsp carob powder + 1 tbsp water for every ounce of unsweetened choc. Abroad, it can be bought as non-chocolate carob chips which would be great for cookies. It is naturally sweet so remember to reduce the amount of sugar in a recipe. I don’t think it is used like this here in Turkey. As far as I know, the people here nibble round the pod itself as a kind of healthy treat! 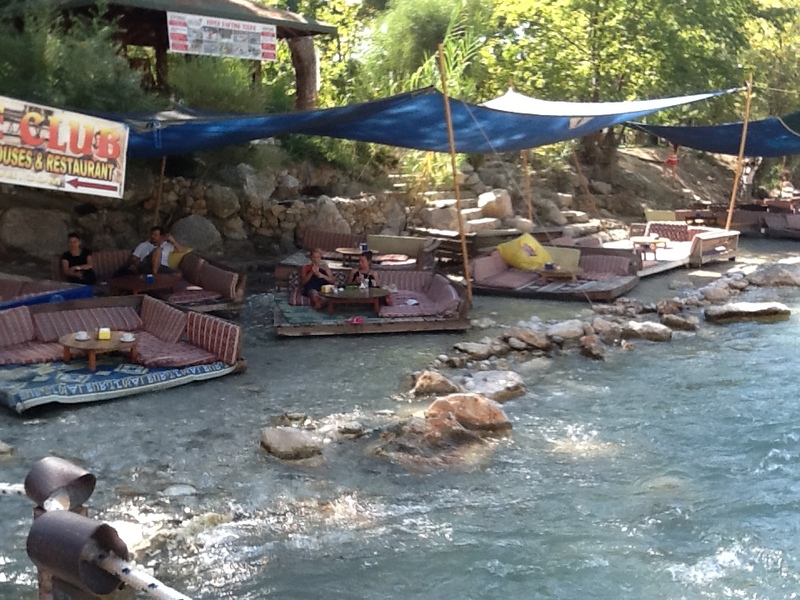 At Saklıkent, we all duly tried this but the taste leaves a lot to be desired (in my opinion). It’s not bad but it’s certainly not a patch on a bar of real choc! TT says the pods are also made into pekmez, a natural kind of syrup, sometimes called harnup pekmezi instead of keçiboynuzu pekmezi. I imagine this is spread on bread and given to children for breakfast as all the other syrups (mainly dut and üzüm/ black mulberry and grape) like this are eaten in this way. Pekmez is considered extremely healthy and children are often given a spoonful at breakfast especially in winter to start their day! There is another biblical reference: remember the story of the Prodigal Son? He squandered his inheritance and wished he could also partake in the pigs’ diet of carob pods! And one final piece of very interesting information: the word ‘carat’ which is used to measure gold, comes from the Arabic name for the carob seeds because of their uniformity in weight! Eventually the system was standardized and one carat was fixed at 0.2 grams. 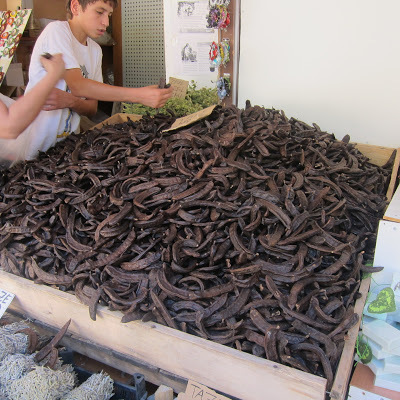 Abroad, carob is available from health food shops and upmarket supermarkets while here in Istanbul, it is found in districts like Eminönü or Kadıköy. Have any of you have ever cooked with carob powder? I would love to know…. very interesting. if your horse eats these pods, their mane falls out. We bought some carob pekmez at the Belevi camel wrestling last December. We used it to make some flapjacks. They were not entirely successful. Tasted OK (if you like carob) but tended to fall apart. It's been OK with fruit and yoghurt. This was a standard flapjack recipe, using the carob pekmez instead of golden syrup or treacle. Were I to try it again I think I would use more pekmez and cook it a little longer. This was an interesting post…I learned something new. I've never seen 'carobs' like that in pods before to be honest. But the bulk stores here I've seen sell carob powder, flour and beans. It said carob's but not sure if it is the same thing that I'm talking about. I should try some…someone told me they use it instead of chocolate powder???? … take care and thanks for this very interesting post. How fasinating – they do indeed look like goats horns!! I've never seen a carob pod before – great post! Odd, aren't they? For me, they will probably remain a curiosity! I use carob pekmez in my carrot cake instead of sugar. It works. Yes I've seen these pods and I was at that very place in Saklikent having tea last week then we moved to another restaurant on the river and had a buffet lunch,it was lovely. Wasn't it wonderful? I bet the lunch was great too! Great post Claudia! The first time I tried these the pazar guy just handed me a pod and demonstrated that I should just chew it. Seemed so strange at first! 😉 My mom used carob powder as a sub for cocoa all the time when we were kids. I do have the carob pekmez and have been meaning to do something with it too. They just don't taste all that great, do they? But how interesting that yr mom actually used the powder… ask her about it and let us know. Fabulous post! I bought some keciboynuzu pekmezi in Dalyan last year and have been stirring a teaspoonful into my roasted barley/chicory root coffee substitute and it really makes it tastier. I'm glad to hear it lacks the stimulants of chocolate, which is why I have to drink this substitute, for a while. Thanks for all the info. The man who sold it to me said it had all kinds of special cures. 🙂 I just thought it was yummy. Hi Amber! A rather belated hello! I have never tried this pekmez – if it is anything like grape pekmez, I can believe it is yummy!! Greetings from Uzbekistan) Googling carob, I came across your blog. Could you advise where I can buy in Istanbul the carob powder? Hİ Kamola! Glad you found my blog! I have to confess I don't know exactly where you can get the carob powder here. I know from email comments that you can grind these pods yourself apparently. But I suggest you go and ask about it in a shop that is selling the pods – they may have it too. As you can see from the comments above, friends here in Istanbul are buying carob pekmez which is the molasses or syrup!